We hear it all the time – “if my child’s baby teeth are going to fall out anyways, why do we need to fix them?” This is a common and very unfortunate misconception. Baby teeth do matter, and they matter in very big ways. When primary teeth are not cared for and monitored closely, they can impact your child’s speech development and chewing efficiency as well as their overall health and comfort. Did you know that dental problems in children are the leading cause of missed school days in the United States? It is not until 12 or 13 years of age that your child will have a full set of permanent teeth. In the meantime, those primary teeth serve a very important purpose. 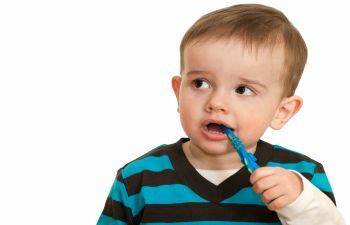 Not only do the presence of primary teeth help your child graduate to a diet beyond soft baby food, but they are also the place holders for the permanent teeth – the ones they will have for the rest of their life. Choosing not to fill a cavity or correct a dental issue in one tooth can lead to the early removal of that tooth. This creates spacing and eruption issues for the adult teeth behind them. In most cases, this equates to orthodontics – an expense far beyond the cost of routine pediatric dental care. Last but certainly not least, if there is an infection in the mouth that goes untreated, it can spread to nearby teeth and even impact your child’s overall health. The demands of proper oral hygiene begin as soon as your baby is born. Bring your child to the dentist starting at the age of 1, or within six months of the first tooth eruption. Establishing good dental habits early is a rewarding gift for your child’s long-term oral health. At Gainesville Dental Group, we proudly treat patients of all ages. In fact, we love kids! Schedule your pediatric dental appointment with us today!